This line is largely open. The line was initially called the Glenturk and Garion Railway. Today it is a part of the West Coast Main Line between Motherwell and Wishaw. The line was planned to run from Coatbridge to Jerviston to Wishaw. A branch from Jerviston to Cleland was added. Further lines went on to Morningside. Closed sections run through the now closed Ravenscraig Steelworks and from Wishaw to Morningside via Coltness. This line runs through an area which was intensively mined for coal. The north part started in Coatbridge where the early ironworks developed and the south part in Motherwell is where the iron and steel industry later expanded. The line was originally encouraged by the Houldsworth family who owned an ironworks company at Newmains called the Coltness Iron Company. Newmains to Wishaw Central and Shieldmuir was built (for the Caledonian Railway) by Duncan and Henderson of Edinburgh. Note to self; was Shieldmuir to Wishaw, Wishaw to Law, Wishaw to Holytown, Wishaw to Newmains via Cambusnethan all built as one scheme - the Wishaw Deviation Line? Further note; when was the Cleland to Morningside section opend, and as what name? This line ran from Coatbridge (from a junction with the Monkland and Kirkintilloch Railway) to Morningside via Wishaw, with a branch from Mossend to Cleland. This is the principal marshalling yard in the west of Scotland. At the south end is a famous viewpoint where the old Mossend station was located. There was a fine view of the yard from a former bing at the orth end but when the yard was redeveloped to have a secure section for Channel Tunnel freight this was landscaped. A short line runs to the east to serve warehousing but this fell from use not long after opening. There was once a connection to the Airdrie and Newhouse Line (Caledonian Railway) via Calderbank low level which served coal mines en route, but this is long gone. Connection to the Clydesdale Junction Railway at Uddingston Junction via the Cleland and Midcalder line. 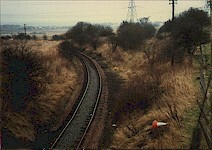 This is the junction between the Wishaw and Coltness's "main line" south to the Coltness Ironworks and the Cleland branch. Today one line goes south towards Motherwell, the one west towards Glasgow and the one east towards the Mossend Marshalling Yard and the north. The junction may also be known as Fullwood Junction. The now closed Clydesdale Steelworks is on the left. The view looks South towards Motherwell. A line ran from Jerviston Junction southwards to the Ravenscraig Steelworks. The north part of the line followed the original course of the Wishaw and Coltness Railway before striking off further east for the works. This was the original Motherwell station. The first class 90 in Scotland - heading south again after travelled north by the Motherwell by-pass line and having turned at the mossend junctions. This site is now Shieldmuir station. From here a spur runs over to the Wishaw Deviation Line for access to Wishaw station. A station has been built here since the photograph was taken. This station is closed. Nearby, to the north, is a new Royal Mail Depot which is rail served. This is on roughly the same site as the former Shieldmuir Steelworks. A new coal loading siding has been laid in from Stirling road junction (just to the south west of the old Stirling Road / Coltness station) past the site of the station to a loading facility. The left photograph shows the site of the former Stirling road junction. The new siding runs away from the camera towards the distant electricity pylon. The costain concrete works are served from here. This works is the only part of the former Coltness Iron Company works at Newmains still in operation. Update: the Costain site has been closed for some time and the opencast loading point has seen little use.